Keep children and all other animals (dogs in particular) away. Unless the bird is obviously injured or in immediate danger, the best course of action is to leave the bird where it is. Contact your local vet, any local animal hospital or phone us on 01487 741140 and we can give you help over the phone. If you need to handle the bird, wear thick gloves (beware of both the beak and feet). If you need to move the bird, wrap it in something warm and place it in a box with plenty of ventilation and keep it warm and dark. The box should be lined with newspaper or clean cloth, do NOT use straw or hay as this can give the birds a fungal lung infection. Try not to disturb the bird and get professional help as soon as possible. Do not try to feed or give it a drink unless you are advised to do so. Our PHONE is answered 24 hours a day in cases of emergency. We are prepared to collect injured birds if you can’t bring them to us (within a reasonable distance). 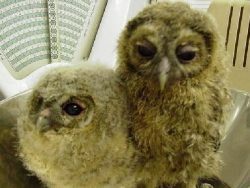 Each year in mid to late Spring, we are contacted by people who have found baby owls that have fallen out of their nests. If the owlet is a young Tawny Owl and is in no immediate danger, then, more often than not, the best course of action is to leave it where it is. Tawny Owls live mainly in wooded areas, but they will also nest in suburban gardens. Often they will use holes in trees as nests rather than building their own, sometimes using old squirrel drays. They have also been known to use the disused nests of other birds and will also nest on the ground, if no other suitable nest sites are available. Usually, they will start laying their eggs around the middle of March, the incubation period is between 28 to 30 days, so the young generally are hatched mid-April. It takes about 5 weeks from hatching before the young are capable of flying, but a week or so before this time the owlets will start exploring the world outside the nest, this behaviour is known as “branching”. When the owlets start branching, it is not unusual for them to fall out of the tree. 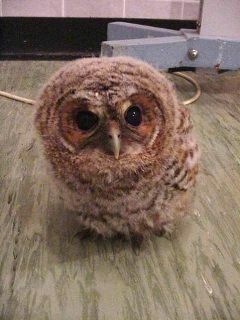 If you find a young Tawny Owl on the ground near to a tree, then it is most likely this is what has happened. Most people’s instincts will tell them that the young bird is in trouble and needs to be rescued, this is not the case, the best thing to do is to leave the owlet where it is and move away from the area. The parent Tawny Owls will often feed the young on the ground, but not while there are people around, and the young Tawny Owls have a remarkable ability to climb back up the tree to the nest site. Often, they will not attempt to climb to the nest during daylight, but will wait until dusk . If the owlet is standing or sitting on the ground with it’s feet underneath it, it is likely that it is not badly injured, another good sign is if it starts snapping its beak at you when you approach. If the bird is lying on it’s back or side, this may indicate injury, or it may just have fallen and not sat up yet. Monitor the young bird from a distance, if you remain close it may not move out of fear. If the bird does not right itself, then it may be injured and need treatment, contact your local vet, any local animal hospital or phone us on 01487 741140 and we can give you help over the phone. If you need to move the bird, wrap it in something warm and place it in a box with plenty of ventilation and keep it warm and dark, and get professional help as quickly as possible. If the young owl is uninjured but in immediate danger then the best course of action is to move it out of danger, either placing it on the ground away from traffic and animals or by placing it on a tree branch. 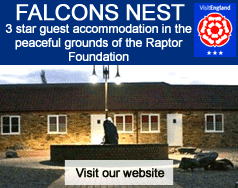 It is best not to try and find the nest to replace the young there as some adult Tawny Owls will often vigourously defend their nest site and people have been known to receive bad head and eye injuries when approaching Tawny Owl nesting sites. 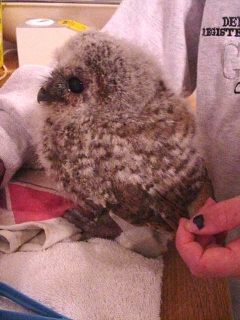 If you do feel that the owlet needs moving, make sure that your hands are well protected, preferably by leather gloves. All birds of prey have very strong feet which are designed to crush their prey to death. It is very natural for even the young birds to use their feet to defend themselves but may also grab onto you as a fear response when you try to handle it. In addition to their strong feet, they have sharp powerful beaks which you also need to be aware of. The best way to pick up the young owl is to approach from behind and use both hands, palms over the top of the body carefully holding the wings to it’s sides and firmly holding the legs between your middle fingers. With very small birds, it may be possible to pick it up with a single hand, with larger birds you may be better off getting a helper with one of you holding the birds feet. Remember, when you try and pick the owl up it is going to be afraid of you, it may try to get away, so try to handle the bird firmly but carefully, try to put as little stress on the bird as you can. If you have moved a young Tawny Owl from the area in which it was found, it may be possible to return it close to the nest site without harm. As with most birds of prey owls have no sense of smell, and the parents will not reject the young because people have handled them. The owlet needs to be returned to the same area that it was found, in a safe but not completely hidden position, it needs to be seen or, more importantly, heard by the parents, which will hopefully return and carry on feeding it. The best time of day to return the young birds is late afternoon or early evening, the time when the adult birds are becoming more active. The longer the young are away from the nest site though, the less likely it is that the parents will carry on feeding them, especially if the young have been absent for more than a day. If you have taken a young owl into care and cannot immediately get it to a suitable vet or rescue centre, then you may have to consider feeding it. All birds of prey are carnivores, they only eat meat and only raw meat. Although the bird is young, do not be tempted to try feeding it on such things as bread dipped into milk, this is not suitable food for an owl of any age (nor do owls eat toast !!). Suitable meat that you may have in the house is raw chicken, rabbit or lean beef, but this is only suitable in the short term. Raw lamb, pork and cooked meats, including pet food, are not suitable foods, if eaten they may make the owlet ill or even kill it. To keep healthy the young owls need a proportion of suitable roughage – in the wild this will be the fur, feathers and bones of the prey that the adult birds will be catching for the young. This roughage will be regurgitated as pellets and helps keep the owls stomach healthy. Local pet shops or birds of prey/falconry centres may be able to provide you with suitable food such as day-old chicks (a staple diet of birds of prey in captivity) or dead mice. Do not attempt to feed the owl with live food, they will not take it and it is against the law. It should be emphasised that in the UK, Tawny Owls are protected by law. You may be committing an offence if you keep a wild owl that you have found, you should get advice from your local vet, any local animal hospital or birds of prey/falconry centre or phone us on 01487 741140. If you are in any doubt about what to do, please phone us on 01487 741140 and we can give you help over the phone.